I use this. Ordered from Amazon. The bottle says ready to use but i mixed it 3:1. Three parts distilled water to one part Ferrique. Use distilled water. Tap water can have different chemicals in it that can kill the Ferrique. Measure your water and then add the Ferrique. Don't add the water to the Ferrique. wow beautiful....how long in the acid----and what do you do when you take it out.....buff??????? Time depends on how black you want the blade and how deep you want the etch. 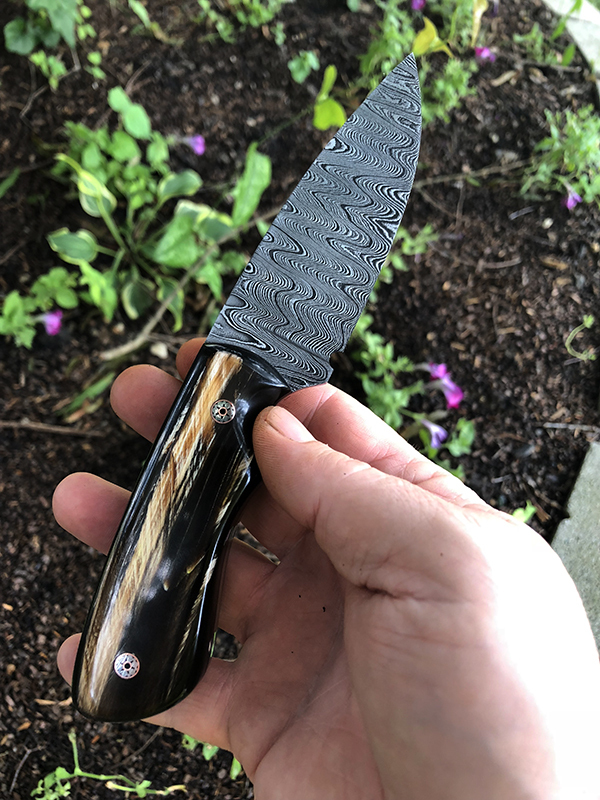 I haven’t worked with Damascus much but I believe on this blade I did three or four rounds of about five minutes each. The blade was hand sanded to 800 grit then etched for five minutes. The blade was sprayed with Windex to stop the etching process. Don’t spray the windex around your etching solution. It will kill it. It was washed in hot water and dried after each round. After the etching process it was hand sanded again with 800 grit to bring out the silver. Some guys also soak the blade in coffee after etching to make the black, blacker. I haven’t tried that yet. Maybe on my next one. There are some very good YouTube videos that explains the process better than I have here. Radio Shack stores sell that as circuit board etchant. Unfortunately, our local RS closed. like the picture I posted on trad gang..do I completely re sand or leave it like it is before I etch.. Yes. After heat treat and temper sand to whatever grit you want the finished blade to be. I usually go to 800. The blade will be shiny and you probably won’t see the pattern. The etching will bring out the pattern.